I’d come to the corner of 69th Avenue and International Boulevard to check out a food cart I’d heard about through vague rumors and scattered Yelp reviews. In this stretch of East Oakland, however, it seemed like everybody knew about it. Everyone waiting in line seemed to be a regular, anyway. 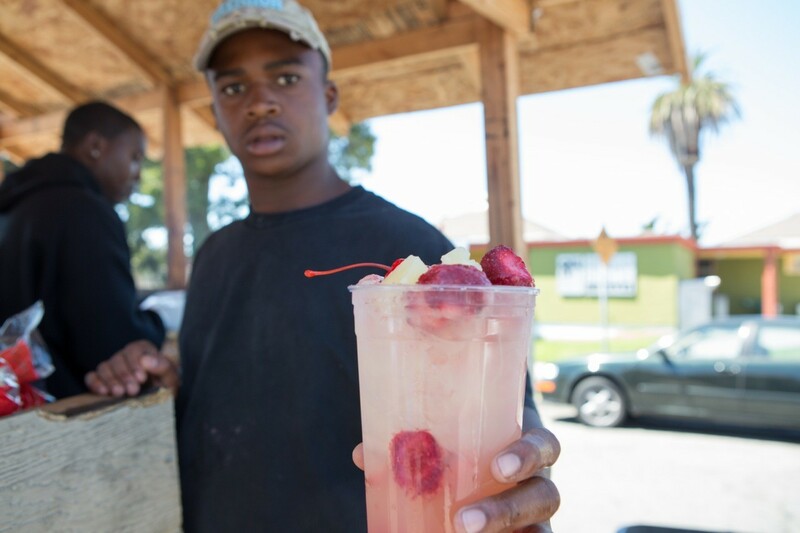 Marco “Co” Pollard, the 28-year-old proprietor of the cart, told me that he’s been running his yet-unnamed business for three years now, together with his nephew, Ramone Curtis, a sophomore at Skyline High. 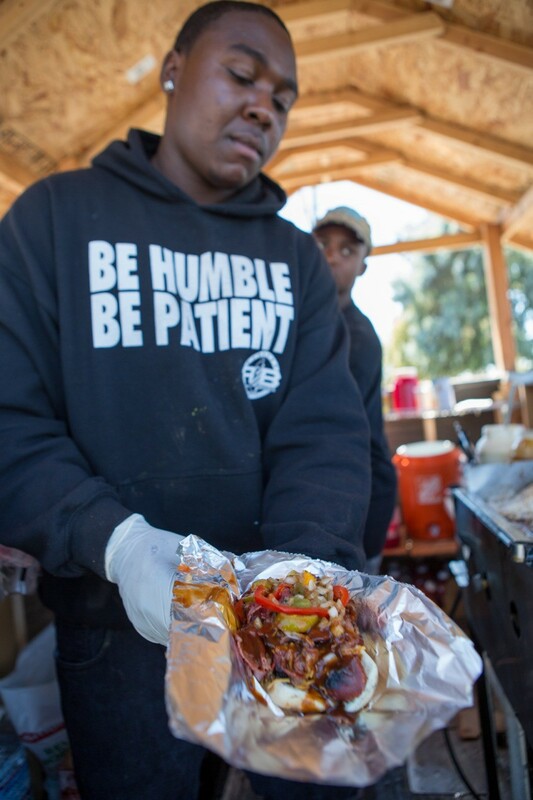 Every Saturday and Sunday, the two park the cart curbside, across the street from the Martin Luther King, Jr. branch of the Oakland Public Library, from around noon to 6:30 p.m., and fire up the grill. It’s a pretty humble operation — just a flat-top griddle set up on a beige trailer that's hitched to the back of an old station wagon. A crude wooden roof protects the food from the elements, and from birds flying overhead. But business is good, Pollard said. On Saturdays, most of his customers are people who live in the neighborhood, but some regulars come from as far out as Berkeley and Vallejo. Two churches (Acts Full Gospel and Bethel Missionary Baptist) are located within a few blocks of where they set up the cart, so Sundays are all about the after-church crowd. Pollard said he wants to name the cart “Grandma Mary’s” after his grandmother, who told him, when he was just five years old, that he would own his own business someday. These days, Pollard said he feels proud to have become a role model to neighborhood kids, who follow his cart down the street on their bikes. “‘Hey, Co!” they’ll call out. Marco "Co" Pollard shows off a fully loaded pastrami link. The menu at, let’s just call it Grandma Mary’s, is simple and streamlined. 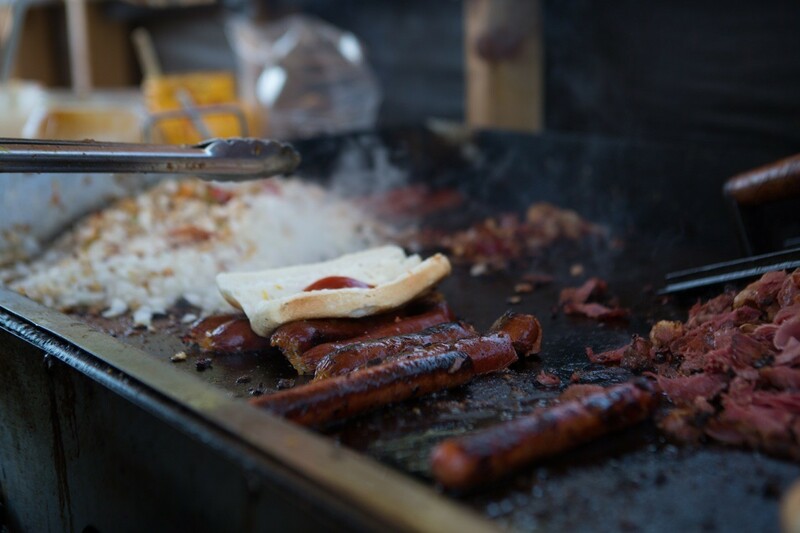 Hot links, mild links, and hot dogs are $2 each. For $2 more, Pollard adds pastrami. A grand total of $5 buys you “The Kitchen Sink,” which adds bacon to the mix. Whatever kind of meat customers pick, most order their sandwich “fully loaded,” i.e., with everything on it. And Pollard really means everything: grilled onions and bell peppers, pickled hot cherry peppers, shredded cheese, ketchup, mustard, mayonnaise, and barbecue sauce. Once in a while, if Pollard is feeling reckless, he’ll run a special, like a chili cheese dog with pastrami and bacon, or — a recent creation — a pastrami dog topped with coleslaw and baked beans. Health food this is not. But while some Slow Food purists might snub their noses, a fully loaded pastrami hot link, the way Pollard makes it, is a beautiful, ridiculous thing — beautiful, especially, if you have a wicked case of the munchies. 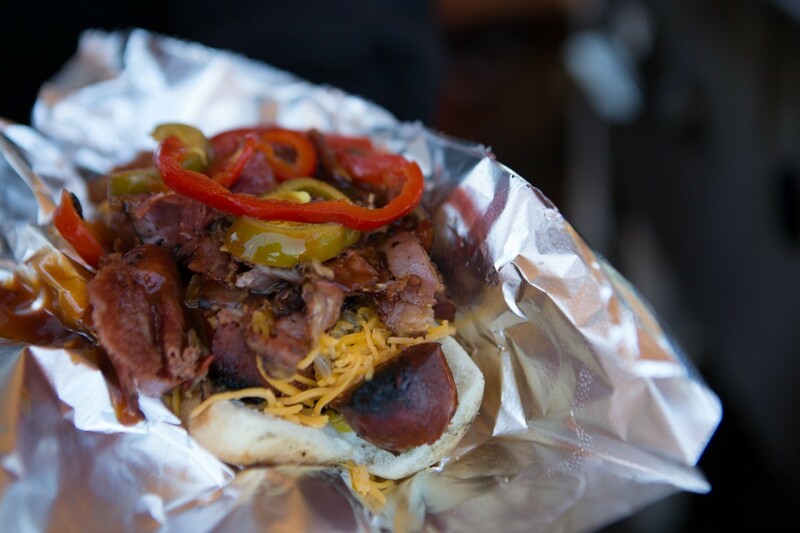 The small, soft hot dog bun is stuffed, fit to bursting, with the grilled link (split lengthwise to maximize the blister and char) and the myriad toppings. Served wrapped in foil, the sandwich is held together precariously so that, if you’re like me, there’s a better than 50/50 chance that some of it will come tumbling onto your pants. Eating this is a pure, uncomplicated pleasure, much in the same way it is a pleasure to eat a good Philly cheesesteak or, to point to the pastrami link’s more immediate cousin, the bacon-wrapped hot dogs sold by Mexican street vendors. Wash it all down with a glass of agua fresca-like strawberry lemonade (available in $1, $2, and $3 cups) — a little bit sweet for my taste, but loaded with chunks of fresh strawberry. Ramone Curtis sells some strawberry lemonade. For now Pollard just operates his cart as a weekend side gig. But he said he has big dreams and tons of recipe ideas — elaborate ones that he isn’t sure he can pull off with his current setup. His next step is to try to get a booth at one of Oakland’s farmers’ markets, and Pollard said he’s already started the application process. He hopes, in fact, that someday Oakland will be known across the land as the Home of the Pastrami Link. “This is our sandwich," he said. "I want people to own it and feel a part of it." What Pollard doesn’t want is to run a brick-and-mortar sit-down restaurant — even though his customers keep telling him to. “I don’t want to be on demand. I want to keep it spicy and jazzy,” he said. That, Pollard explained, is what keeps fans of the pastrami hot link always coming back for more.